Standing 32 stories above the white, sandy beaches of Sunny Isles, the Trump International Beach Resort is a distinctive tower of luxury near tony Bal Harbour. You’ll have everything at your fingertips, from three nearby golf courses to access to jet skis, catamarans and kayaks. The comfortably sized, contemporary guest rooms are equipped with wet bars, microwaves, refrigerators and CD players. For complete rejuvenation, head to the 8,000-square-foot Aquanox Spa. The resort’s signature restaurant, Neomi’s, offers contemporary American cuisine with a tropical flair. The 8,000-square-foot Aquanox Spa offers six treatment rooms for you to drift off into a world of relaxation. With a menu featuring everything from facials to body polishes, the hardest part of your spa day will be choosing which treatment to indulge in. An outdoor paradise can be found at the Trump hotel’s two beachside pools, adorned with hot tubs, fountains and waterfalls for aesthetics, and a bar and grill for eats and treats throughout the day. Love to shop? You’ve come to the right place. 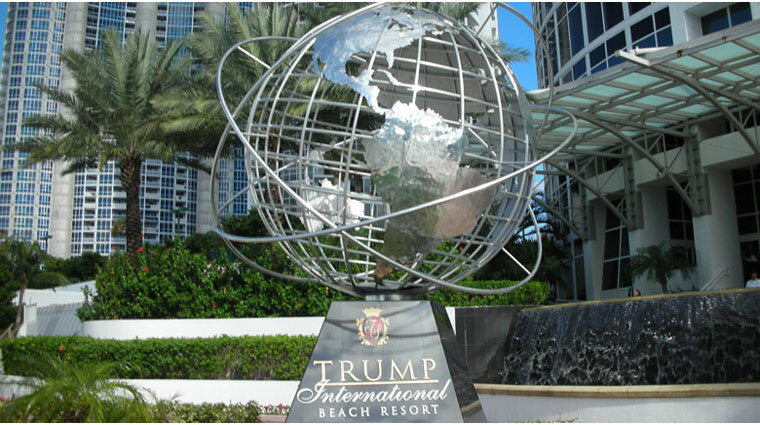 Trump International Beach Resort Miami is just minutes away from luxury shopping destinations like Bal Harbour Shops, Aventura Mall and The Village at Gulfstream Park. From nail treatments to a new hairstyle, Studio by Vasila at the Miami hotel is your one-stop source for beauty services and head-to-toe pampering in Sunny Isles Beach. Neomi’s showcases modern American flavors with a South Florida twist. The restaurant’s poolside perch facing Sunny Isles Beach makes it a favorite locale for relaxed fine dining. 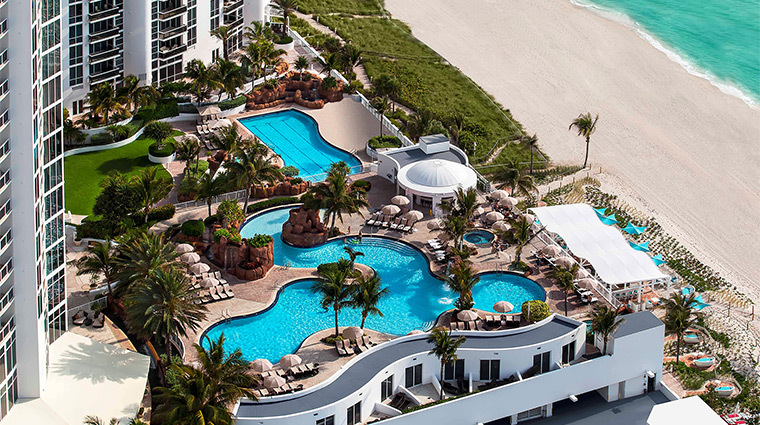 The resort fee at this Four-Star Miami hotel includes pool and beach access, as well as towel service, use of the gym and locker room facilities, and access into Trump International Beach Resort’s kids’ club, Planet Kids (for kids ages 4 to 12). For a luxurious afternoon by the water, rent one of the private cabanas that include air-conditioning and televisions, as well as butler service from the pool bar. The beach cabanas comes with private bathrooms and showers. Little ones will love Planet Kids, a complimentary, fully supervised program that teaches tiny travelers about Florida's environment and the wildlife that surrounds the resort. 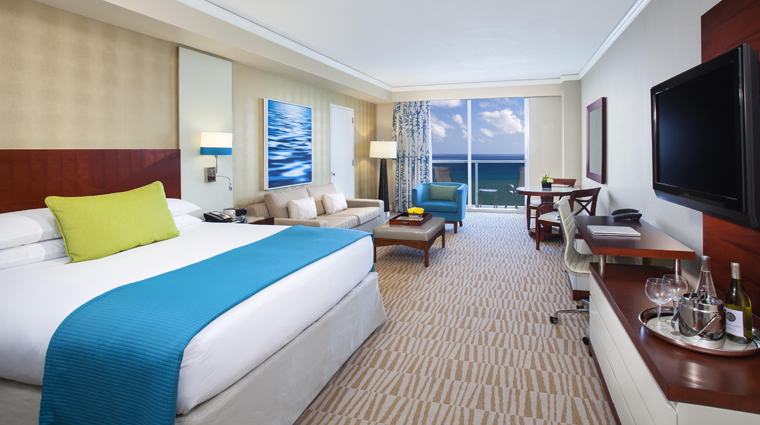 The rooms embrace their beachside setting with a neutral color palate of sandy beige and brown accented with pops turquoise and water-themed artwork. Luxurious amenities include 46-inch LED TVs, pillow top mattresses, full stocked mini-refrigerators, wet bars, Keurig coffee makers and individual climate controls. Spacious bathrooms feature granite counters, glass-enclosed shower, bathrobes and premium bath amenities. 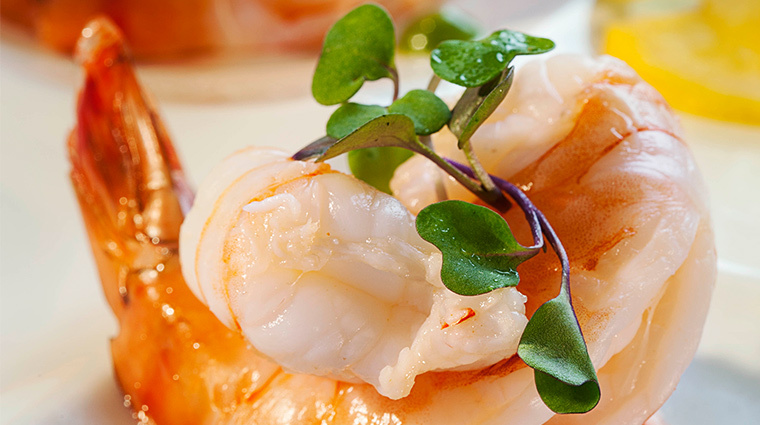 With its location on the edge of the Atlantic Ocean, it’s no surprise that Neomi’s serves up the freshest seafood. Look for dishes that reflect the South Florida setting, including locally caught fish and citrus-inspired dishes. For a unique night out, try the Lava Stone Grill experience available on Friday and Saturday evenings on Neomi's terrace. The flame-broiled favorites pair perfectly with one of the menu's refreshing specialty mojitos. In the lobby level of the Four-Star hotel is Fusion Lounge, the property’s Asian-inspired restaurant and sushi bar. Order up sushi rolls, sandwiches, salads and various Asian-inspired appetizers. Gili’s Pool Bar is where you’ll find lighter fare such as sandwiches, finger foods and snacks. Gili’s Beach Club is the first Sunny Isles Beach restaurant located directly on the sand. With stunning views of the ocean, exceptional mojitos and a Mediterranean-inspired menu, it’s available for beach-goers, hotel guests and those renting poolside cabanas.